1 Soda! Peanuts! These bubbly and crunchy treats don't seem like much on an airplane flight if you are very hungry. However, traveling on a plane is a luxurious experience compared to traveling to America in the nineteenth century. Eating sad, boiled potatoes and drinking tea for days and days with a bit of salty herring was not much fun. 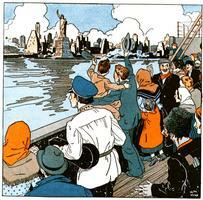 2 The brave immigrants faced much more severe challenges than a poor diet on their trip across the sea to America. Their first big task was to pack as much as possible. They brought whatever they could carry. Some had suitcases and trunks. Others carried tins, leather sacks, baskets, and other odd containers. They took their mattresses, quilts, and feather pillows with them, too, because the ships only provided blankets. They often also packed food like smoked ham and sausages that they thought they might not be able to get in America. 3 People had to make heartbreaking decisions about what they could carry with them to the New World. Some of them wore all of their clothing in layers so they didn't have to pack. One young girl had a good idea. She mailed her dolls to her relatives in America before she came. Another girl carried a book of fairy tales tightly in her hands for the whole trip. 4 Saying goodbye to their homelands was heartbreaking for the immigrants. They never knew if or when they would see their friends or relatives again. The immigrants who lived in the country had to first take a train to a port city. Boys and men had to sometimes get permits to leave the country because their governments would rather have them stay and serve in the army. Government officials made these permits hard to get. People staying behind gave their loved ones a big sendoff. One Russian village had a band play as the families rode off to the ship. With any luck, the musicians played well enough to make that a pleasant memory! 5 Immigrants faced many challenges even before they boarded the ship. Thieves often stole items when the travelers stayed at inns or slept outside (although pickpockets may have had trouble if the people had lots of layers on.) Men and boys had to bribe guards in order to cross borders if they did not have the proper permits for leaving the country. One family even got stuck in a town on the Black Sea for a whole year because of a local war. Once they reached port, doctors vaccinated and disinfected all passengers and examined them for illness. Everyone's hair was checked for lice because they carried a dangerous disease called typhus.